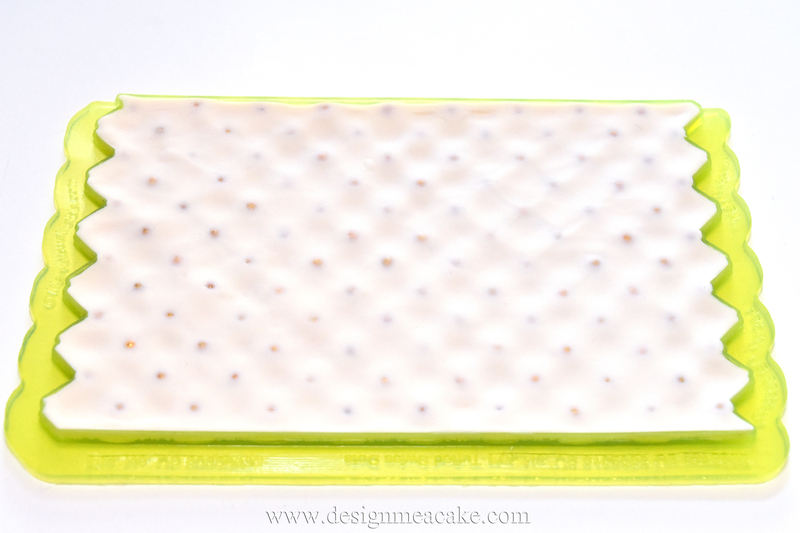 I posted a new cake tutorial for a cake design I made. I love to get creative sometimes and do cakes that are amazing but the truth is that most clients either can’t afford them or they just want something simple. And to be quite honest, simple cakes that are fast can sometimes make more money than all those super busy complicated cakes that take a lot more time to make. For as much as I love to get fancy, simple designs are heaven on a busy week. 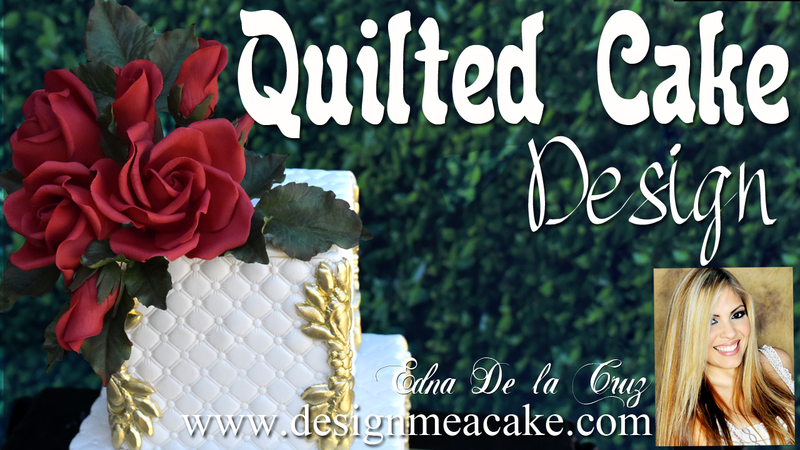 Quilted cakes have been in style for many years. I have made so many of them with different patterns and I can say that to this day, brides still love them. They are simply classic and elegant. I got this new mold from Marvelous Molds and I love the design. In the video I did the cake without using dragees and the cake looks amazing. The really cool thing about this mold is that you can actually place the dragees on the mold before placing the fondant. I won’t lie, I was a bit worried about doing this. All I thought was that the dragees were gonna be rolling everywhere and they where not gonna stick to the fondant. 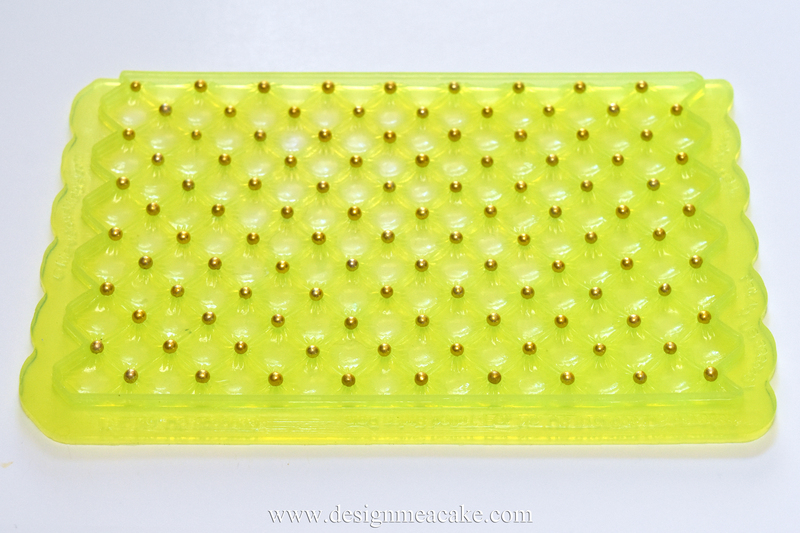 I placed each little ball on each hole and then I placed the fondant on top. I used no glue at all, and to my amazement, all the dragees stayed in place. You know how many dragees I had to place in cakes, one by one with pliers or tweezers over the course of almost 22 years???? All I can say is that I was super impressed and I love the fact that this mold can be used with or without the dragees. Since this was a square cake, I wanted to finish the borders with some gold details. I decided to use the Vibrance Brooch Mold. I wanted to cover the edges and this mold is the perfect height for this purpose. To finish it I painted it in Gold Highlighter. I also cut this mold and added pieces of it to the board to give it a finished look that made everything cohesive. Most of the time I like to finish my cakes with whatever color of flowers I have to use and then I combine them with filler flowers in other colors. 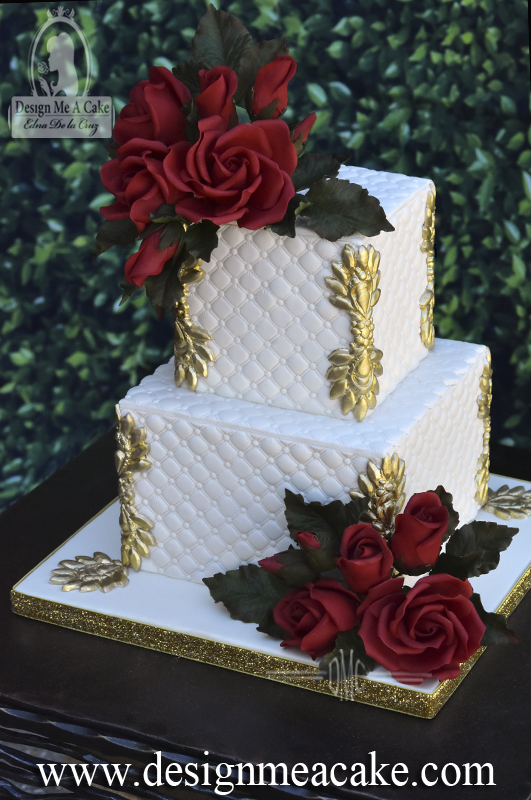 But for this cake, the red roses made a beautiful statement. No filler flowers used unless it was smaller roses, buds or leaves. I have a tutorial on how to make roses with circle cutters that I made so many years ago and it’s still a great way to get started if you want to play with gumpaste roses and you all you have are circle cutters. I also have a DVD with 4 hours worth of roses that include different ways to make them; how to make leaves, buds, how to color them and even how to make thorns. Marvelous Molds is giving away 3 of their new molds and the rules are these ones; Go to Instagram and follow Marvelous Molds and Design_Me _a_Cake. Marvelous Molds is choosing a winner that does all the steps above so make sure you do that and I will post the winner as soon as I find out. You can also get an extra entry if you tag a friend. I love how the cake turned out and I know brides love this type of cake. Below I am posting the links for the tutorials or products I used to make this cake. Click on the photo for more info. Click here or on the photo below to go watch tutorial.